A few days before the announcement, an analyst with KGI Securities stated that the iPhone 7 Plus would have 3GB of RAM, as opposed to the 2GB of the vanilla iPhone 7. Well, you know how Apple likes to keep such details to itself, so despite it’s all official now, you won’t find the info on Apple’s specs page. A new listing on GeekBench, however, seems to corroborate the story. A device that goes by the name “iPhone9,4”, but is presumably the iPhone 7 Plus, has been spotted in the benchmark database. It’s powered by a 2.23GHz dual-core CPU (apparently, for the purposes of GeekBench testing, the LITTLE part of Apple’s otherwise quad-core big.LITTLE-like setup carries no weight), and sports 3GB of RAM. It’s also running iOS 10.0.1. 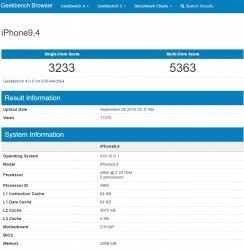 RAM aside, those are some pretty impressive test results from GeekBench 4. The Exynos-powered Galaxy Note7 we have at the office does almost precisely half the iPhone 7 Plus in single-core, but edges by about a hundred points in multi-core. Meanwhile, the OnePlus 3scores in the low 1700s in single-core and just above 4000 in multi-core with its Snapdragon 820 chip. Mind you, the new GeekBench 4 numbers shouldn’t be compared directly with ones from GeekBench 3 as the two versions of the benchmark have been normalized around different Intel CPUs, and the same devices score lower on v4.0, than they did on v3.0. Another disclaimer due here as usual, is that the tested iPhone may very well be a pre-production unit, and final commercially-available devices may differ from this performance.